Space.com explains a new idea that the “goldilocks” zone around suns may be different than previously thought. Some extrasolar planets that one might assume are too cold to host life could in fact be made habitable by a squishing effect from their stars, a new study found. A planet’s midsection gets stretched out by its star’s gravity so that its shape is slightly more like a cigar than a sphere. Some planets travel non-circular, or elongated paths around their stars. As such a world moves closer to the star, it stretches more, and when it moves farther away, the stretching decreases. When a planet’s orbit is particularly oblong, the stretching changes are so great that its interior warms up in a process called tidal heating. “It’s basically the same effect as when you bend a paper clip, and it gets hot inside,” said researcher Brian Jackson of the University of Arizona’s Lunar and Planetary Laboratory. Jackson and colleagues created a computer model to simulate this effect on exoplanets, and found that the process could shift the range and distance of the “habitable zone” around a star in which planets would have the right temperatures needed to harbor life. Dust – often thought of as an impediment to lunar exploration – could be put to good use to build giant telescopes on the Moon – perhaps some large enough to fill entire craters, says a team of US researchers. The team, led by Peter Chen of NASA’s Goddard Space Flight Center in Greenbelt, Maryland, US, has devised a simple method to create a concrete-like substance using a mixture of carbon nanotubes, epoxy and a crushed rock material that NASA uses as a stand-in for Moon dust. Using the mixture, they built a 30-centimetre disc. Then they added more liquid epoxy to its surface and spun it, coating it with aluminium in a vacuum. They believe the process could be scaled up to produce 20- to 50-metre-wide telescopes on the Moon. Should we send a mission to Mars that is only one way? A soldier is volunteering to go. I would prefer that a self-sustaining colony were created. It seems rather futile to go with no hope of return. Popular Mechanics have a fascinating how-to guide on the Google sponsored prize to get private enterprise onto the moon. Realistically, the odds seem to be against a prize-winning lunar mission by 2012. But take heart: Lindbergh and Rutan beat long odds. If you manage to snag a friendly billionaire and follow our how-to guide, there’s no reason you won’t be ready to join the pantheon of aerospace prizewinners. 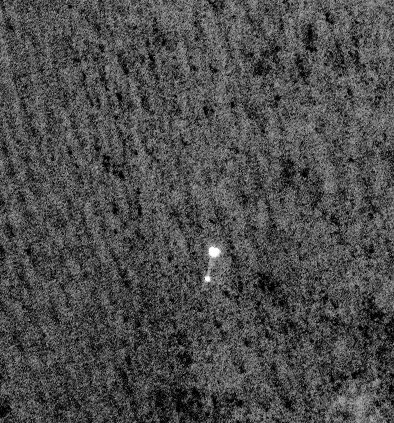 The Mars Reconnaissance Orbiter managed to snap a photo of the Phoenix during its parachute-aided descent to Mars. 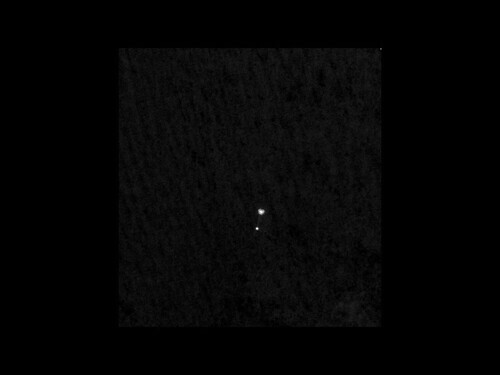 Our technology continues to amaze me, if we can have an orbiter of another planet take a photo of another satellite descending to that planet, what can’t we do? This photo is truly historic, and is making the rounds on the web today. People really do get excited about this stuff, and I can see why. 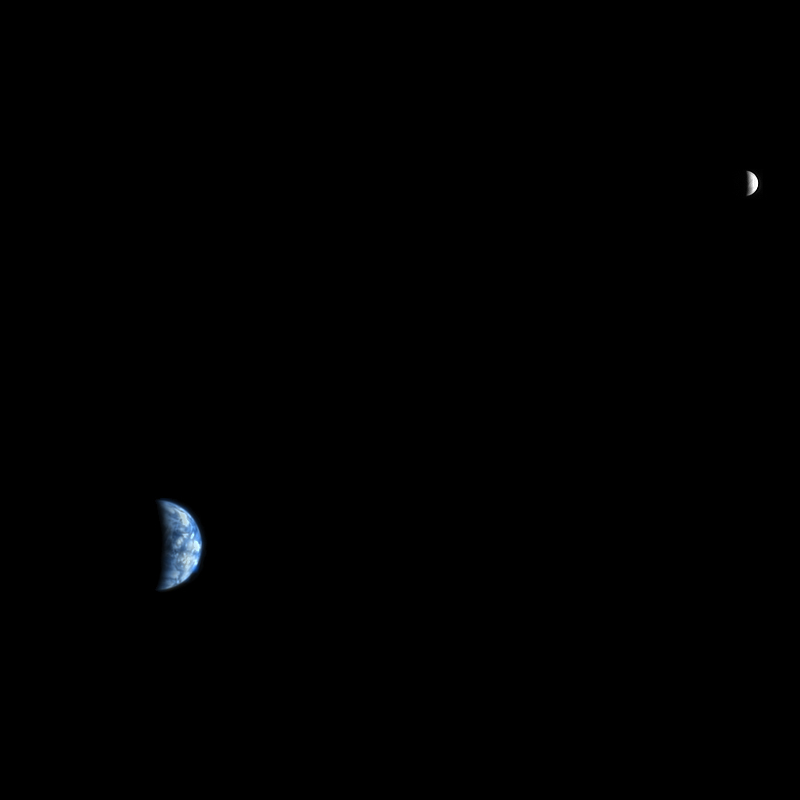 The Earth and Moon as seen from a probe orbiting Mars using a HiRes camera. Amazing. Looks like progress. Here’s hoping. Scientists have constructed a custom enzyme that reverses the process by which the human immunodeficiency virus (HIV) inserts its genetic material into host DNA, suggesting that treatment with similar enzymes could potentially rid infected cells of the virus. In tests on cultured human tissue, the mutated enzyme, Tre recombinase, snipped HIV DNA out of chromosomes.